Bratislava or Pozsony in Hungarian and Pressburg in German, is the capital and largest city in Slovakia. It has a population of almost 415,000 and is the administrative, cultural and economic centre of the country. Before 1919, it was known as Presporok in Slovak. Bratislava has a very pleasant medieval inner city with narrow, winding streets, a hill-top castle next to the river Danube, and many historic churches and buildings to visit. The old town is centered on two squares, Hlavne namestie (main square) and Hviezdoslavovo namestie.Hviezdoslav square, named after a famous Slovak poet. Of a rather different architectural character are some of the communist-era buildings found in the modern parts of the city; a prime example is Petrzalka housing estate, the biggest Communist-era concrete block housing complex in Central Europe, which stretches on endlessly just across the river. Move east and there are plenty of rural places to explore. Farms, vineyards, agricultural land, and tiny villages are situated less than 50 kilometres to the north and east of Bratislava. Today, Bratislava and its surroundings form the most prosperous region,NUTS-2 Region in Central and Eastern Europe, with a per capita GDP of around 186% of the EU-27 average and it is the fifth most prosperous region in EU. From the city's origin until the 19th century, Germans were the dominant ethnic group.However, after the Austro-Hungarian Compromise of 1867, active Magyarisation took place, and by the end of World War One 40% of the population of Pressburg spoke Hungarian as their native language, 42% German, and 15% Slovak. After the formation of the Czechoslovak Republic in 1918, Bratislava remained a multi-ethnic city, but with a different demographic trend. Due to Slovakization, the proportion of Slovaks and Czechs increased in the city, while the proportion of Germans and Hungarians fell. In 1938, 59% of population were Slovaks or Czechs, while Germans represented 22% and Hungarians 13% of the city's population. The creation of the first Slovak Republic in 1939 brought other changes, most notably the expulsion of many Czechs and the deportation or flight of the Jews during the Holocaust. In 1945, most of the Germans were evacuated. After the restoration of Czechoslovakia, the Benes decrees partly revoked in 1948 collectively punished ethnic German and Hungarian minorities by expropriation and deportation to Germany, Austria, and Hungary for their alleged collaborationism with Nazi Germany and Hungary against Czechoslovakia. The city thereby obtained its clearly Slovak character.Hundreds of citizens were expelled during the communist oppression of the 1950s, with the aim of replacing reactionary people with the proletarian class. Since the 1950s, the Slovaks have been the dominant ethnicity in the town, making up around 90% of the city's population. After the fall of the Great Moravian Empire, Slovakia became part of the Kingdom of Hungary from the 10th century until the end of the First World War when the Treaty of Trianon created Czechoslovakia, a country which Slovaks are widely proud of - for example, some Czechoslovakian representatives, such as Alexander Dubcek and Gustav Husak, were ethnically Slovak. This lasted until the fall of Communist rule in Czechoslovakia, during the Velvet Revolution of 1989. In 1993, peaceful differences between Czechs and Slovaks when rebuilding their nation after the fall of Communism led to the dissolution of Czechoslovakia into two separate and independent nations: the Czech Republic, and of course Slovakia or Slovak Republic. Slovaks and Czechs have generally friendly relations, and the two nations cooperate together frequently on international issues. Bratislava was the capital (1536-1784), the coronation city (1563-1830) and the seat of the diet (1536-1848) of the Kingdom of Hungary for many years. Since 1960, it has been the capital of the federal state of Slovakia within Czechoslovakia and, since 1993, it has been the capital of independent Slovakia. Although today, Bratislava's population are mostly Slovaks, from the 13th to the early 19th century, the majority ethnic group in the city were the Germans, who remained the largest ethnic group until the First World War in 1910, 42% were German, 41% Hungarian and 15% Slovak out of a total population of 78,000. The Bratislava Region is the wealthiest and most economically prosperous region in Slovakia, despite being the smallest by area and having the second smallest population of the eight Slovak regions. It accounts for about 26% of the Slovak GDP. The GDP per capita (PPP), valued at €54,400(~$71,000) (2015), is 188% of the EU average and is the third-highest of all regions in the EU member states. Unemployment rate in Bratislava was 1.83% in December 2007.Many governmental institutions and private companies have their headquarters in Bratislava. More than 75% of Bratislava's population works in the service sector, mainly composed of trade, banking, IT, telecommunications, and tourism.The Bratislava Stock Exchange (BSSE), the organiser of the public securities market, was founded on March 15, 1991. Companies with the highest value added according to TREND TOP 200 ranking (2011), operating predominantly in Bratislava, include the Volkswagen Bratislava Plant, Slovnaft refinery (MOL), Eset (software developer), Asseco (software company), PPC Power producer of heat and steam and Trenkwalder personnel agency. Volkswagen Group took over and expanded the BAZ communist-built factory in 1991, and has since considerably expanded production beyond original Skoda Auto models. Currently, 68% of production is focused on SUVs: Audi Q7; VW Touareg; as well as the body and under-chassis of the Porsche Cayenne. Since 2012, production has also included Volkswagen up and badge-engineered SEAT Mii and Skoda Citigo. In recent years, service and high-tech-oriented businesses have prospered in Bratislava. Many global companies, including IBM, Dell, Lenovo, AT&T, SAP, and Accenture, have built outsourcing and service centres here or plan to do so soon. Reasons for the influx of multi-national corporations include proximity to Western Europe, skilled labour force and the high density of universities and research facilities. Other large companies and employers with headquarters in Bratislava include Slovak Telekom, Orange Slovensko, Slovenska sporiteľna, Tatra banka, Doprastav, Hewlett-Packard Slovakia, Slovnaft, Henkel Slovensko, Slovenský plynarenský priemysel, Kraft Foods Slovakia, Whirlpool Slovakia, Zeleznice Slovenskej republiky, and Tesco Stores Slovak Republic. The Slovak economy's strong growth in the 2000s has led to a boom in the construction industry, and several major projects have been completed or are planned in Bratislava. Areas attracting developers include the Danube riverfront, where two major projects are already finished: River Park in the Old Town, and Eurovea near the Apollo Bridge. Other locations under development include the areas around the main railway and bus stations, around the former industrial zone near the Old Town and in the boroughs of Petrzalka,Nove Mesto and Ruzinov. It is expected that investors will spend €1.2 billion on new projects by 2010. The city has a balanced budget of 277 million Euros, with one fifth used for investment. Bratislava holds shares in 17 companies directly, for example, in the public transport company Dopravny podnik Bratislava, the waste collection and disposal company, and the water utility. The city also manages municipal organisations such as the City Police or Mestska policia, Bratislava City Museum and ZOO Bratislava. In 2006, Bratislava had 77 commercial accommodation facilities of which 45 were hotels with a total capacity of 9,940 beds. A total of 986,201 visitors, 754,870 of whom were foreigners, stayed overnight. Altogether, visitors made 1,338,497 overnight stays. However, a considerable share of visits is made by those who visit Bratislava for a single day, and their exact number is not known. The largest numbers of foreign visitors come from the Czech Republic, Germany, the United Kingdom, Italy, Poland and Austria. Among other factors, the growth of low-cost airline flights to Bratislava, led by Ryanair, has led to conspicuous stag parties, primarily from the UK. While these are a boom to the city's tourism industry, cultural differences and vandalism have led to concern by local officials. Reflecting the popularity of rowdy parties in Bratislava in the early to mid-2000s, the city was a setting in the 2004 comedy film Eurotrip, which was actually filmed in the city and suburbs of Prague, the Czech Republic. A month before Christmas the Main Square in Bratislava is illuminated by a Christmas tree and the Christmas market stalls are officially opened. The Bratislava Christmas Market produces a distinctive atmosphere and attracts thousands of people every day, who come to meet their friends and chat over some mulled wine and traditional specialties. Around 100 booths are opened every year. It is opened most of the day as well as in the evening hours. Bratislava Milan Rastislav Stefanik Airport - The airport is the largest in the Slovak Republic. The vast majority of scheduled flights are operated by the budget airline Ryanair, which flies to 15 destinations in the United Kingdom, Ireland, France, Spain, Italy and Belgium. Additional carriers are Danube Wings flying to Kosice, Rijeka, Split and Zadar; Czech Arlines to Prague and Kosice; Norwegian Air Shuttle to Oslo and Copenhagen; UTair to Moscow, Air Onix to Kiev and Sun d'Or to Tel Aviv in seasonal flights. Direct bus services operating in approximately hourly intervals connect the airport with Vienna airport and the city of Vienna. Be aware that the staff might take some regulations especially seriously. For example, you will not be allowed a small handbag/laptop bag AND hand luggage. If you are flying by Ryanair and have check-in luggage, do not let the small size of the airport fool you. Arrive at the airport well in advance of your flight, as the queue can get very long. After leaving the terminal, do not expect any shuttle bus, but a regular public transport. Simply Use bus No 61 or N61 at night, for a direct connection to the terminus Main Railway Station Hlavna stanica or change at Trnavske myto to get to the city center in order to get to the tram stop, use the underpass and the exit marked Centrum or city center; take any tram in the direction towards center. You can also wait one more stop and exit at Racianske myto, where trams also travel to the city center and there is no underpass to cross. City centre is 15-20mins stroll south from Main Railway Station. Bus drivers don't sell tickets in Bratislava so you need to get tickets in advance. Use the vending machines at the bus stop but note that you will need euro coins as the vending machines don't take notes,there are also two big red ticket machines in the terminal building close to arrivals, which accept banknotes. You can also buy tickets in the tourist and exchange offices in the terminal, but they have only limited working hours. Be aware that the airport shops and kiosks are not very helpful when it comes to changing bills into coins. A screen in the arrivals hall displays actual departure times of next public transport buses and buses to Vienna. There is no direct connection between the airport and the main bus station. Bus 96 goes to Slovinska - about 11 minutes. Get out and take trolleybus 205 to Autobusova stanica (Bus station), which is about 10 stops and 14 minutes from Slovinska. Taxis are inexpensive, usual price when ordering taxi by phone for whole 9km journey from airport to city centre should be not more than €15-20, if hailed on street expect double prices €20-30, always make sure taxi driver use taxi meter, if he refuses don't get in the taxi. Avoid unofficial black taxis which will overcharge you. Public transport buses are cheaper, a single ticket to the city centre costs €0.90. Please validate the ticket in the marking machine immediately after getting into bus; valid for 60 minutes from the moment of validation; transfer to other public transport lines allowed. Vienna International Airport is located 40 km (25 mi) from Bratislava, near to the town of Schwechat in Austria, after which the airport is named. The airport is the home base of the flag-carrier Austrian and the budget airline Fly Niki. Blaguss (Bus). 13 buses a day between Vienna Airport and Bratislava city centre. The buses alight at the bus terminal under the New Bridge and continue towards Bratislava Airport. €7.20. Postbus/Slovak Lines (Bus). Bus run almost every hour between Sudtiroler Platz and Vienna Airport and Bratislava Bus Station, some buses run as far as Bratislava Airport. Please check the timetable. You are allowed to transport two pieces of baggage per person at €1.00 per piece. The baggage tags can be purchased from ticket window or from the driver. It is possible to buy tickets online or at a driver. They speak or understand English. The bus tickets include WiFi, a free cup of coffee/tea/capuccino, and an in-seat monitor with a variety of on-demand movie options. Avoid a taxi from the taxi line outside the bus station, or you will be fleeced. Even if the taxi driver claims to go by the meter, they will later show you a sheet showing a tariff of 20-30 euros for leaving the bus station, even if the distance traveled is a kilometer or two. €7.70, €14.30 return. Train. Unfortunately, trains from Vienna to Bratislava do not stop at Vienna airport. However, there is a direct connection between both central train stations. It is possible to take the train (S7 or RSB7) from Vienna Airport to Wolfsthal on the Austrian border 45 minutes, cheapest ticket is 3 VOR-Zone for €5.40 and change to Slovak-operated regional bus 901 that will take you to Bratislava city center (€1.50, €0.75 for under 26 years of age, children under 6 travel free) in just 15 minutes. The buses leave at 55 minutes past the hour, but be aware that the departures/arrivals of the bus are not always aligned with the trains so you run into risk of up to two hours of waiting in a small village 5 km from the border. The bus 901 does not stop at the railway station, the bus stop is at the main road at Hauptstraße 40 approximately 300 m away. Walking to Bratislava from here will take an hour and is not recommended though there is a path near the Danube. All in all, this is not a preferable way to get to Bratislava, but could be useful if schedules have been checked or if you have a back-up plan to arrange a ride or taxi which can be hard to explain if you don't speak Slovak or German, from Wolfsthal. Taxi. Cab Fare could be anywhere from 45 Euro to 145 Euro, depending on where you are going to in Bratislava and the Taxi Company you are hiring. It is very reasonable to book transportation in advance from a Private hire, which will lower your costs significantly and improve your comfort, because driver will wait for you directly at the Schwechat arriving hall. Brno Airport has a very small albeit good selection of destination offerings. Budapest and Prague airports are about a 4-5 hour journey but can mean substantial savings on intercontinental trips, especially to New York City or Beijing. Most international trains stop at the main train station Bratislava hlavna stanica that has a good connections to buses. To get to the city center from the central train station, take Bus line 93,exit 2nd stop Hodzovo nam next to the presidential palace or 3rd stop Zochova and go through the underpass by foot into the center or Bus line X13, exit 3rd stop Namestie SNP right by the pedestrian zone. The other principal station is Bratislava-Petrzalka, situated in a residential district, south of the river Danube. The station serves as a terminus for some of the trains from Vienna. Bus 80 at Kollarovo namestie departs from outside the station building or use the underground passageway in the station hall then hop on any of the buses that leave from the opposite side of the road. Buses 91 and 191 at Novy most, 93 and 94 at Hlavna stanica and Vazovova respectively, all go directly to city centre. Do not take a taxi from the taxi line outside the train station, or you will be fleeced. Even if the taxi driver claims to go by the meter, they will later show you a sheet showing a tariff of 20-30 euros for leaving the train station, even if the distance traveled is a kilometer or two. Vienna 1h. There are two regional express services leaving from different stations in Bratislava - one from Bratislava Hlavna stanica the Main station via Marchegg and the other from Bratislava Petrzalka station via Kittsee - each operating in hourly intervals, with first daily service leaving at 05:21 and the last train leaving at 22:21. As of November 2015 trains leave at 21 minutes past the hour and return at 43 minutes past. There is no service either way at 21:00 though. Both services terminate at Wien Hauptbahnhof in Vienna. Tickets are valid for both routes. A return ticket called EURegio purchased in Vienna costs €16, is valid for four days and also allows use of all public transportation in town on the first day of validity. If only travelling one way, it is possible to buy a ticket for €10.50 from the OBB website for travel via Marchegg. Prague, EC trains every 2 hours. Online tickets are much cheaper than the tickets purchased at the station, but you should buy them at least 3 days in advance. It is possible to get on a through sleeper car, attached to train R 719, however the journey only takes 6½ hours meaning you won't get too much sleep. Berlin 9h, three direct EC trains, another two with change in Prague and through sleeper cars attached to EN Metropol. Online ticket is much cheaper than ticket bought at station, but you should buy it at least 3 days in advance. Budapest 2¾h, six EC trains a day, departing from Budapest Keleti and Budapest Nyugati station. The train shuttles every 2 hours from both stations. The first train from Bratislava departs at 5:50 and the last direct one at 19:54. From Budapest, the first one departs at 5:25 and the last direct one at 15:25. Price 17,50€ for a return ticket which is issued whether you plan on returning or not valid for one month. An alternative route is to take a domestic train from Keleti station to Komarom and walk across the border - bridge over the Danube to Komarno in Slovakia and take a domestic Slovak train from there to Bratislava. Cost 6,5 plus 4,5 = 11€ considerably less as there is no surcharge for international trains, but only cheaper if you don't plan to return to Budapest. Recommended if you want to get an impression of rural life in both countries. Warsaw Two daily direct trains, 7h for morning train or 8¾h in through sleeper cars attached to train Chopin. There is a limited offer,SparDay for daytime trains, SparNight for sleepers of discounted tickets to Budapest via Bratislava, they're much more cheaper than normal tickets to Bratislava. Kiev 31 hours. Direct train (R 801), often delayed. Changing trains is hours faster. Minsk and Moscow 18/28 hours, Daily sleeper train from Moscow to Sofia. Coach lines connect Bratislava with all of Slovakia, a high number of Czech cities and a number of EU destinations, including London, Paris and daily buses also depart to Budapest, Prague. The most frequent international coach connection by far is Vienna though, with three lines running every hour from Vienna's Sudtirolerplatz near Hauptbahnhof via Vienna International Airport. Blaguss has tickets sold by the driver priced at €9.00, with stops in central Bratislava beneath Novy most bridge and Bratislava Airport. Slovak Lines has buses that stop at the Coach Terminal and Bratislava Airport, for a cost of €7.70. The tickets can be purchased from the driver or booked online. RegioJet buses are by far the cheapest and go for as little as €1, but normal price is €4 each way. RegioJet buses start/terminate at Mlynske nivy in Bratislava and at Ernst Happel Stadium in Vienna, with stops at Vienna Airport and Novy most in Bratislava. Seats can be prebooked online or at ticket windows,one is conveniently located at the Bratislava train station. A trip from/to Vienna takes 1½ hours. The Central Coach Terminal or Autobusova stanica is at Mlynske nivy, at the eastern border of the city centre. To get to/from the main railway station at Hlavna stanica, take trolleybus No 210. If you need to get to/from the city centre, take trolleybus No 205 or 202 the terminus is behind the Tesco department store at Kamenne namestie or buses No 50 geting on/off at Safarikovo namestie, close to the banks of the river Danube or 70 getting off at Novy most, the New Bridge. Since October 2017 the Coach Terminal is being completely overhauled and all bus services relocated to the location on the opposite side of the street. The reconstruction should be finished by the end of 2019 and the Central Coach Terminal will be in the basement of shopping centre. Regular tourist boat lines operate on the Danube from spring through fall on routes from Vienna. You can find routes and schedules here. Since 2006 it is possible to get to Vienna using a high speed ferry boat as well, yet the rates are higher compared to other means of transport. A one-way ticket from Vienna to Bratislava by Twin City Liner costs about €25-30 whereas a return train ticket is less than €15. The Twin City Liner's boats travel at 60 kmph and the journey takes about 1 hour 15 minutes from Vienna to Bratislava and about 1 hour and 30 minutes from Bratislava to Vienna almost as much as the train. Unlike the train though, which stops at stations distant from the center about 2-3 km, the boat stops are in the very centres of both Vienna Schwedenplatz and Bratislava Novy Most. Danube river is getting very popular for multi-day tours. Some people do their paddling all the way from Germany to Black Sea (more than 2516 km / 1563 mi), also known as TID. Bratislava is well developed for paddling. There are several paddling clubs at Karloveske rameno at river km 1872, near Stary most at r.km 1868. Free camping is possible along river shore; good places are around km. 1872 right, 1864-60 left. Bratislava lies on the border of two other countries and has a relatively good road system. The town can be accessed by motorways i.e. limited access highway from northern Slovakia and Poland, Czech Republic, Hungary as well as Austria. As a result, you can pass the town without having to leave the motorway at all. Similar as in Austria or Czech Republic it's required to have a sticker vignette on your windshield to drive on motorways. Stickers can be bought at any regular gas station - it's recommended to stop at the first gas station after crossing the border. Cheapest vignette costs €10 and it is valid for 10 days. After entering the city, a parking information system is in place to lead you to the next free parking spot. In the center of town you either can use one of the paid underground garages or buy a parking card from vendors in yellow vests and try to find a free spot in the streets. The former is recommended on weekends as finding a parking place in the one-ways can turn into a real head breaking puzzle. If you do find a spot in the street and it's a weekday between 8AM and 4PM, a parking card may be necessary. You need them in the center of the city only, parking on the streets is free otherwise. You can purchase parking cards from vendors in yellow vests or in newsstands; they cost €0.80 and are valid for 60 minutes. It may be a good idea to leave the car at the Aupark parking lot which also serves as a Park and Walk facility for tourists, the indoor parking facilities as well as parts of the outdoor parking lot are closed from 11PM to 10AM, the rest of the parking space is free to use 24/7. You can leave your car here and walk through the park and across the Danube to the city center, which is a 10 minute stroll, or just use public transportation. Renting a car is also an option, especially if you are visiting destinations outside of Bratislava. All major rental companies have a stall at the airport but most have a city office as well. Bratislava has nice surroundings for biking and an international bike route leads along Danube river, EuroVelo 6. The route from Austria via Bratislava down to Hungary is well marked but the town itself has not many biking routes and they are mostly ignored by car drivers. There are milions of ways though to bike in the Carpathian hills and along the rivers Danube and Morava. Generally, Bratislava is a walking city. The center is very small and cosy and you can easily walk from one side to another in a few minutes. The city center is a pedestrian area, however, be aware of cyclists and occasional cars. If you need to travel outside of the center, use the trams or trolley buses if you need to get from one point to another quickly. Bratislava has a rather good public transportation system although some of the vehicles are quite old, especially during peak hours older buses can be seen. Buses tend to be the slowest means of transportation. Stops normally don't need to be requested unless stated otherwise - request stops are marked zastavka na znamenie at the bus stop sign as well as on electronic information displays in most buses/trams. Bus doors are usually opened by the driver, except for the new buses; tram and trolleybus doors usually have to be opened by yourself by pushing a green or yellow button at the doors. There are three main tickets you might want to use when traveling by public transport within Bratislava city borders. The short route ticket costs €0.70 and is valid for 15 minutes. It is a transferable ticket, but keep in mind that the waiting time for the next connection might be long and the ticket can run out, so you will have to stamp another if the line you change to runs late. While you can use this this ticket as a transferable, it makes sense mostly when you do not need to change lines and travel short trips within the the city centre. The second type of ticket is the half hour ticket, valid 30 minutes. It costs €0.90, which you can use for any number of travels within the specified time period. The 60 minutes ticket costs €1.20 and is valid within Bratislava zones 100 and 101 as well as one outside zone. When traveling in the city, only the travel time of a single ticket is taken into account, not the list of zones. If you are staying for a holiday, consider buying one from a choice of longer term tickets valid for 24, 72 and 168 hours (1, 3 and 7 days) for €3.50, €8.00, and €11.40 respectively. For traveling just outside Bratislava, you will need a ticket with more zones, depending on your destination. You must validate your ticket in the validation machines on the bus/tram immediately after boarding via any door. When it comes to proving that you have not exceeded the time stated on your ticket e.g. 15 minutes on a 15-minute ticket, official schedule times are decisive,not actual travel times do not give in to unfriendly ticket inspectors claiming the contrary. You can find out the scheduled travel times in the left-most column of the schedules, left of the stop name or via the internet. Bus, tram and trolleybus drivers in Bratislava do not sell tickets, therefore you need to obtain a ticket prior to entering a bus or a tram. There are ticket vending machines at most stops in the town. Most vending machines only take coins, but some do take credit cards. There is a ticket vending machine inside the Central Railway Station that takes credit card so it's easy to buy long-term tickets when you first arrive in town. SMS tickets are also available, but only if you send a text message from a cell phone with a Slovak SIM card, which rules out all short-term foreign tourists. If you purchased a return ticket in Vienna, it also serves as a pass for all public transportation and does not need to be validated. Besides vending machines, tickets are also sold in many newsstands and very conveniently for travelers arriving by train, late in the evening or at weekends in railway stations at the ticket counters,ticket counter 16 at the main railway station. You can also purchase tickets for public transport in every tourist information bureau. Try asking for the Bratislava City Card which combines a 1 to 3-day ticket with various discounts and is available at information bureaus. Hodzovo namestie (Presidential palace) for northwest- and east-bound bus connections to Petrzalka, Dubravka, Lamac, Devinska Nova Ves. Postova pedestrian area at Obchodna street for trams Ruzinov, Raca, Nove Mesto, Zlate Piesky, Karlova Ves, Dubravka. Most SNP close to St. Martin's Cathedral and the Danube banks for trams and for south- and west-bound buses Petrzalka, Karlova Ves, Dubravka, Podunajske Biskupice. Main tram, bus and trolley lines operate from 4:30AM until approximately 11:30PM. If you need to travel by bus at night, go to the main railway station which is the main night line interchange point or use the bus stops at Presidential palace, Hodzovo namestie. All night lines have common departure times from the main railway station at 11:30PM and then every 60 minutes for every line and outbound direction until 3:30AM. Some lines have an extra outbound departure at midnight. When traveling by night lines, please remember that every stop needs to be requested. Also note that especially around midnight on Fridays and Saturdays, the buses tend to be very crowded on some lines as young people return from clubs. You can get all relevant information about public transportation in Bratislava including schedules, maps and an online route planner. Although this is not the site of the transportation company, it always contains official and up-to-date data. If necessary, it is also possible to walk to Petrzalka station from the city some 25 minutes. The path is clearly marked now but note that Petrzalka is just a little more than the biggest block flats housing estate in Central Europe. Head for the bridge with the UFO-like looking tower atop it,Most SNP. Once you reach the bridge, you will notice that there is a walkway running along the underside of it, for pedestrians. Once on the other side of the Danube river, follow the right hand-side of the bridge with a walkway made of red paving. This will lead you to the station. Alternatively, you can walk through Bratislava's equivalent of the Central Park called Sad Janka Kraľa and visit the Aupark Shopping Mall at the park. Once exiting Aupark on the other side, turn right and follow the street to get to the pavement mentioned above. The route is very safe during the day, but for typically western-looking tourists, it might be dangerous at night,although not more than in any other European panelak housing estate. Take a guide, if needed. If you want to walk from the station to the city, turn right outside of the station building and follow the path described above in reverse direction. Inspections occur on a regular basis, especially on busy lines frequented by tourists lines to/from the airport, Central Railway Station and Bus Terminal are among the most inspected. An inspection can range from a brief encounter to a stressful nightmare, since ticket inspectors are paid based on the amount of collected fines and are therefore incentivized to collect as much as possible, tourists being their favorite target. Make sure to have a valid and validated ticket at all times - for instance, most foreign students cannot use a discounted ticket unless they're a student in Slovakia. Because of past incidents, all inspections are audio recorded by body-worn devices. Inspectors are always plain-clothed without uniforms and usually come in three - two are authorized transport inspectors and one is a security guard. - demand a ticket while on or in the immediate vicinity of a public transportation vehicle,only if you have just gotten off. - call the Police if you refuse to produce proof of identity,the Police have the right to check your ID, refusing to produce ID will lead to detention until your identity is established. - force you to pay on the spot through threats or intimidation,although paying on the spot is perfectly legitimate, so long you agree to it. - raise the fine but it is raised automatically after 10 days. - on demand, produce a photo ID identifying them as a ticket inspector,always demand to see photo ID to prevent scams. - add any delay of the vehicle to your ticket expiration time ie. if you're on a bus with a 15 minute ticket and the ride should only take 10 minutes according to the official schedule, but instead it takes 20 min. due to traffic, you cannot get a fine. Under Slovak law, the fine is a private civil debt and remains a civil debt to the transit company until paid. You Cannot be prosecuted for riding without a ticket or for refusing to pay the fine in Slovakia. If, at any time during a ticket inspection, you feel threatened or harassed, call the Police on 112. Do not take a taxi from the taxi line outside the bus or train station or any taxi from the street for that matter, or you will be fleeced. Even if the taxi driver claims to go by the meter, they will later show you a sheet showing a tariff of 20-30 euros for leaving the station, even if the distance traveled is a kilometer or two. A good price per kilometer is around 0.80 to 1 euro, a great price is about 0.50 euro. Locals will always call a taxi service and order the cab for pick up,believe it or not, that's the cheapest way to get a cab. You can Google a taxi service in Bratislava,known ones are: FunTaxi, HappyTaxi, Trend, etc. It's very likely the dispatcher won't speak English, in this case you can use local apps such as HopIN, Liftago both available on Google Play and iTunes or Uber and order it without much fuss. If all else fails, ask a local to call you a cab. St. Martin's Cathedral Dom sv. Martina – the largest and one of the oldest churches in Bratislava, situated below Bratislava Castle. The Gothic cathedral, formerly the coronation-church of several Hungarian kings, begun in 1204, and reconsecrated in 1445, was restored in 1861-80. The tower is surmounted by a pyramid bearing a gilded Hungarian royal crown. Monday – Saturday 9:00 – 11:30 & 13:00 – 17:00, Sunday 13:30 – 16:00. Bratislava Castle Bratislavsky hrad – the castle itself is already opened after reconstruction and hosts the expositions. The SNP Bridge (Most SNP; previously called Novy most – The New Bridge – a bridge over the Danube river, with its flying saucer-shaped structure housing a restaurant called UFO. There is an observation deck on its roof, open from 10:00 – 23:00 daily, offering great views of the old town, as well as the apartment blocks in Petrzalka. Entrance costs €6.50, but is free of charge if you eat in the restaurant. Slavin monument – on the top of the hill behind the castle, overlooking the entire city. This is a monument in memory of Soviet casualties in the liberation battle of Bratislava in World War II. It is the highest place in the city, and thus the best place for viewing the city. Slavin actually is a cemetery and thus rather quiet. On warm nights it's a very romantic place, allowing you to sit in the shadows of the monument and look at the traffic below. To get there, take trolleybus no. 203 from Hodzovo namestie in front of the Presidential Palace in the direction Budkova and get off in 9 minutes at the last stop, then walk 500 m along Stara vinarska and then Pazickeho streets. Slavin is near an embassy district. Devín Castle hrad Devin – ruins of the large castle next to the confluence of the Danube river with the Morava river. It is about 20 minutes from the SNP Bridge with bus no. 28 or 29. The place is nice for walks, and there are many monuments and statues. There are ruins from the past Church and estate, and the upper Castle is open now too. A few small caves provide exhibits showing medieval objects from the castle site. €5. Red Stone Castle Cerveny Kamen Castle)- a must-see palace on the way to the Small Carpathian Wine tour. Eurovea – the shopping centre situated just next to the Danube river. There is a promenade close to the river where people like to relax in the grass. Next to the Eurovea there is a new building of the Slovak National Theatre or nova budova Slovenskeho narodneho divadla as well as The Warehouse no. 7 – an example of the industrial architecture in Bratislava. St. Clare's Church or Kostol klarisiek – a Gothic church on Klariska street, in the historical center; currently used as a concert hall. Church of the Annunciation Kostol Zvestovania / Frantiskani / Frantiskansky kostol. Church of the Holy Savior Kostol Najsvatejsieho Spasiteľa. Maximilian's Fountain Maximilianova fontana, also now as Rolandova fontana – Roland's Fountain – built by stone cutter Andreas Luttringer and commissioned by Hungarian king Maximilian in 1527, this was the first fountain in Bratislava. Primate's Palace Primacialny palac – currently the seat of the Mayor of Bratislava. Old Town Hall Stara radnica – next to Primate's Palace, on Primacialne Square 3. Grassalkovich Palace and gardens Grassalkovicov palac or the Presidential Palace or Prezidentsky palac – a Rococo/late Baroque summer palace with a French garden, used as a seat of the President of Slovakia. In one of the garden's alleys you will see a row of trees planted by famous people such as Juan Carlos I (King of Spain). In front of the Palace you will see the Slovak National Guard. The Church of St. Elisabeth Kostol svatej Alzbety, nicknamed The Blue Church or Modry kostolik – a beautiful art nouveau church finished in 1913, a must see. Located on Bezručova street. Grosslingova High School Gymnazium Grosslingova – the art nouveau high school just next to The Blue Church. Academia Istropolitana – the oldest historic University in the area, which is now occupied by the state of Slovakia, from the 13th century. Michael's Gate,with Tower Michalska brana – 51 m tall tower above the gate with its green copper roof is one of the best known and the oldest buildings in Bratislava. It was built in the 14th century as one of the four gates to the city. Laurin's Gate - Laurinska brana. Pharmacological Museum - Farmaceuticke muzeum. Slovak National Gallery - SNG. Bratislava City Gallery - GMB. Milan Dobes Museum – a small museum featuring modernist Op-art. It lies in the city center and is recommended to all interested in the development of modern art. Main Indoor Market - Trznica at Trnavske myto – one of the few examples of Slovak high-tech architecture. One can buy high-quality fruit and vegetable inside. Slovak National Museum - SNM, infront of the museum there is a statue of the first president od Czechoslovakia, Tomas Garrigue Masaryk. Chatam Sofer Mausoleum - and the Jewish Cemetery – one of the world's most sacred places for the Jewish community. However you must prearrange a visit with the caretaker and a tour-guide. Jewish Community Museum and the only Sinagogue in Bratislava – situated in the Heydukova Street. The Slovak Radio Building - Slovensky rozhlas - Its main building is a peculiar 60 meter high reversed pyramid from the communist era and a landmark in sharp contrast with the building of the Slovak National Bank just across the street. Bratislava has one of the smallest historical centers around but the charm is more concentrated. The streets have been completely renovated over the last ten years, bringing life back here. Since then a multitude of cafes, bars and restaurants of all kinds have opened here, accompanied by a few souvenir shops and fashion stores. On warm days almost every cafe has an outdoor seating section in the street, bustling with life and giving the city a unique cozy feeling. When it comes to sightseeing, Bratislava Castle generally is a must and is already opened after the reconstruction. You can visit also Slavin memorial for some really astounding views of the city. It's a calm and romantic spot but beware, it can get really windy up there. The City Museum located in the Old Town Hall offers visitors climbing up the steep stairwells of the clock tower or seeing the town's historical dungeons, an exhibition that was quite outdated but still scary in 2008. In summer, you can also visit Bratislava Zoo, providing a nice walk between the animal enclosures, the latest addition being some rare white tigers. The facilities of the zoo are slowly being renovated to attract more visitors and the zoo is a favourite for families on sunny days. A DinoPark has been constructed near the last part of the zoo where you can look at interesting prehistoric facts and large models of dinosaurs. You can also go to the Botanical Gardens of Comenius University Botanicka 3, take trams No 1, 4, 5, 9 or 12 to stop Botanicka zahrada for quiet and peaceful strolls in this green space. For a relaxed afternoon in the park, head either to Sad Janka Kraľa park, on the right bank of the river Danube and next to Aupark shopping centre, the oldest public park in central Europe. Relax at the embankments on both sides of the river or head to Horský park (Forest Park) north off Slavin memorial for a civilized stroll through the forest. There's a small cafe here as well as a pub, the latter mostly populated by students from the nearby campus. For a more outdoorsy experience, hop on bus No 203/213 to Koliba and walk up to Kamzik,takes about 30 minutes uphill. If you are there, definitely visit the last buffet on the left Bufet Kamzik for some old school buffet meals and Kamzicek - mulled wine with some spirits to warm you up or try the newly renovated facilities of Partizanska luka and Snezienka, all with extensive picknicking areas and loads of fireplaces for grilling. The area is several kilometers long and you can either walk here from the terminal station of bus No 212 Vojenska nemocnica or take a bus to Patronka and use bus No 43 driving up the area and back every 15-30 minutes depending on time of day/year as well as weather. Only cars with a permit can enter the area but there is a parking lot at the entrance, close to a bus stop. However during weekdays the parking is often full quite often - nearest parking is Tesco HM Lamac,approx 700m from there. Snezienka's grass fields and the top of Kamzik hill are connected with a chairlift, operating Thursdays through Sundays and on holidays, the price for one ride being approx. €3. In December, be sure to indulge in the scents and flavours of the traditional Christmas Market in front of Old Town Hall and on the Hlavne namestie (main square). The market compared to the ones in Prague and Vienna is smaller, but has a much friendlier, almost family-like atmosphere and feels much more traditional and less overtly commercialized than others in the region. The people of Bratislava love to meet here for a drink and a bite to eat; try the varene vino or mulled wine. Authentic Slovakia tours. If you are looking for unconventional way to see the city, try vintage Skoda car tours organized by Authentic Slovakia. Tour takes you to off the beaten track places out of the Old Town,includes nice views from the hills, socialist architecture, good local knowledge and stories. Bratislava Free Tour. Popular & lively Free walking tour covering the city's sights, culture & history. Every day at 11am & 3pm. Speedboats. Kupeľna 6. Enjoy the beautiful view of Bratislava and the unique nature surrounding the river Danube right from the deck of a speedboat. Bratislava is the home of the world famous Slovak Philharmonic Orchestra so if you love classical music, you should consider attending one of the concerts in the historic Reduta building. For more cultural indulgence, the Slovak National Theatre offers a wide selection on ballet, opera and theatre performances. Although most of the activities have been moved to a city-district-in-the-making on the banks of the Danube, some performances are still being held in the historical theatre building, which gives them a unique feeling but a higher price tag as well. The old theatre building is right in the middle of the city at Hviezdoslavovo namestie. The new theatre is accessible by bus No 88 from the Coach Terminal at Mlynske nivy, get off at Landererova or by buses No 50, 70 and 78 stop is called Wustenrot. None of these stop directly at the theatre though, so you should count on a 5-10 minute walk from the bus stop to the theatre. You cannot miss the building as it is of unmistakably communist megalomaniac design covered in white marble. The entrance is facing the Danube so you need to walk around the building to get in. Note that the riverside is currently being developed and the whole area is one big - although very clean, hats off - construction site and will remain that way at least until end of 2009. Natural Science Museum, Vajanskeho nabrezie 2 - echoing the communist era, the natural science exhibitions have an interesting collection of artifacts and is slowly being transformed into a modern era exhibition. National Museum at the foot of Castle Hill, Zizkova 14 - a unique exhibition on ancient Egypt was held here until end of August 2008, together with permanent archeological collections and more. Bratislava Castle, and the Museum of City History in the Old Town Hall, including the museums of history and music as well as the city dungeon and the exhibition on medieval justice. Gerulata, Gerulatska ul. - this is an ancient Roman military camp with archeological findings on display. If you're into all things Roman, you should also consider a visit to the nearby Carnuntum which has a large archeological site and is only a few minutes by car from Bratislava. Museum of Transport, Sancova 1/a - with a display of historical vehicles, situated in the first railway station in the city, very close to the current Main Railway Station, surprisingly interesting if you are interested in the topic. Museum of Trade, Linzbothova 16 - this museum has some remarking pieces of historic advertising plates and other artifacts. Jewish Community Museum, Heydukova 11-13 - rare Jewish ritual tools, gold-embroidered mantles protecting the holy biblical scrolls, unique photographs of students who had attended the famed Bratislava rabbi school that reveal even to this day the atrocities of the Holocaust. It is situated in the Heydukova Street Synagogue, which is the only synagogue in Bratislava. Constructed in 1923-1926, it is a Cubist building designed by the Bratislava-based Jewish architect Artur Szalatnai-Slatinsky and is listed as a national cultural monument. Orthodox in orientation, the synagogue still serves as an active Jewish house of worship. The Jewish Community Museum with a permanent exhibition - The Jews of Bratislava and Their Heritage is installed upstairs and during the summer season is open to the public up till September, every Friday 1 till 4pm and every Sunday 10 am till 1pm. Museum of Czechoslovak fortification system. One of the most sophisticated fortification system ever built that used to defend sovereignty of prewar Czechoslovakia. You can get to know every day routine of Border Guards on the Iron Curtain boundaries during the Communist era. A ride in a historical cars along fortification system is possible. For a taste of visual arts, pay a visit to the National Gallery at the embankment between Starý most and Novy most with permanent collections of Slovak and European medieval art pieces, although the temporary exhibitions tend to be far more interesting. Bratislava City Gallery is also a good pick to see displays of historical fine arts, paintings and sculptures along with interesting temporary exhibitions. If you like modern art better, pay a visit to the Danubiana Art Museum on the southern edge of Bratislava. A bus service #90 has recently been set up which runs from the Slovakian National theatre and terminates at the art museum however the times are infrequent so it is best advised to check the timetable first. There is currently no machine or vendor to purchase a bus ticket for the return journey so buy an extra on your way to the museum. Every year in the weekend around 24 April Bratislava celebrates a festival called Bratislava for All, giving locals and visitors alike the possibility to visit most of the facilities governed by the city for free or a reduced fee, this including most of the museums and galleries. In May, the city's museums and galleries keep their gates open to visitors until late at night, this being called the Night of Museums and Galleries. If sports are your thing, know that ice hockey is the national sport of Slovakia. The local hockey team, HC Slovan Bratislava. HC Slovan has been playing since 2012 in the Kontinental Hockey League (KHL). Matches are played frequently throughout each year beginning in September and concluding in the spring of the following year. Home games are played at Slovnaft Arena also known as Ondrej Nepela Arena or Orange Arena, Odbojarov 9. Many Slovaks are passionate about both watching and playing ice hockey. The stadium can be reached easily by public transport. Many other sports are also played in Slovakia such as football, volleyball, or tennis. Football is the second most favorite sport in Slovakia. Many players play in international teams all over the world such as Marek Hamsík in SSC Napoli. The most beloved football team is Slovan Bratislava. Since Peter Sagan took part in the world famous Tour de France, cycyling has become another favorite sport for the Slovaks that they like to watch and support. Slovaks also like to engage in some more adventurous sports activity such as bungee jumping from the Lafranconi bridge or target shooting in Bratislava and in it's vicinity. Over the last two decades, many foreigners have been moving to Bratislava to study and work at the many international companies that created new jobs. After work, many expatriates and their Slovak friends hang out at casual events where everybody speaks English and enjoys the evening together. For travelers to Bratislava, joining these usually free events is an excellent and fun opportunity to meet local people and learn from them about what one should see or do in Bratislava next day. Bratislava Language Exchange Meeting, where people from different countries get together at tables and teach each other a foreign language. Toastmasters Club Bratislava, a speech club where people practice their public speaking skills. 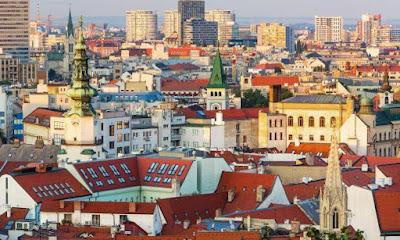 Bratislava Expat Meetup and Internations Meetings for the more business-oriented crowd that seeks to expand their network while having a glass of Martini in a stylish sky bar. International Students Parties, where the foreign exchange students dance the night away and knock out their brains. Upcoming events can be found in this calendar of international events. There are multiple universities that have courses and classes for foreigners, too. You can also study Slovak language for foreigners at one of the universities or at private school. Slovakia is a member of the European Union, therefore, any citizen of a European Union, European Economic Area country or Switzerland can work and live there without restrictions. Tourists seeking duty-free goods should be warned to make their purchases before returning to the airport as duty-free goods available in the departure lounge are roughly double the cost of identical goods purchased in local supermarkets. Shopping Palace Zlate Piesky - near the Zlate piesky lake in the NE part of the city buses 53,56,65, tram 4. Drink and eat in one of the many restaurants in Old Town, or take a short walk from city centre to Danube promenade, where you can also choose from various restaurants in Riverpark or Eurovea. As everywhere else in the world, Typical local restaurants located near the tourist spots and in the busiest streets downtown are aimed at overpricing tourist for mediocre at the best food - use common sense to distinguish tourist trap from a normal eatery. There are more places in Bratislava, opened in recent years, that aim for fresh and quality gastronomy with touch of traditional, but also modern cuisine. Prices are very reasonable compared to other popular tourist locations in Europe. Massimo Ristorante, Dvorakovo nabrezie 4, 811 02 Bratislava River park promenade. 9.am - 11.pm. Provides very nice atmosphere and surrounding thanks to its location in Riverpark- right on the bank of river Danube. Restaurant has opened outside terrace operating whole year. Opened kitchen gives you feeling of cleanliness and transparency. This is surely one of few no problem restaurants in Bratislava- if you desire for something not listed in menu, they will do their best to fulfill your wish anyway. Sky bar & restaurant, Hviezdoslavovo namestie 7, 811 02 Bratislava city centre, 11.am - 02.am. In case you prefer to have a picturesque panoramic view of the historic city center you would like Sky bar & restaurant on the roof of one of the Old Town houses located on Hviezdoslavove square, very near to historic Opera House and St. Martin's Cathedral. View from the roof terrace is very nice also for taking photos. It operates as a mediterranean restaurant and in the evening and night also as a bar with wide selection of e.g. vodkas (70 types) and long drinks. For table in night reservation is needed. AlFaro, Pribinova 8/A, Bratislava Eurovea promenade. You can enjoy Danube embankment and promenade or even little shopping in Eurovea after lunch. This restaurant is typically full of residents and regular customers, which is a reliable marker for good not tourist thievery oriented place. In summer season (approx. may-september) you can enjoy lunch or house made lemonade and nice selection of wines on the pontoon terrace right over the water- unique and pleasant experience especially in hot months. Lemon Tree, Hviezdoslavovo namestie 7, 811 02 Bratislava city centre. This restaurant is also located in the city centre and has nice and cosy atmosphere. It presents thai cuisine awarded by Thai Select for reasonable price and offers fit dishes and tasting menus. They organize musical evenings with live music jazz, soul, you can start your night out here with dinner and later decide whether you'd stay, or move to one of many bars and discos in downtown area. Downstairs from the restaurant is a Rum club, where you can enjoy rums from all over the world and cigars. Fou Zoo, Sevccenkova 34, 850 00 Bratislava,5 minutes from city centre by taxi. 12.am-11.pm. If you are used to Michelin like restaurants this one is probably the closest. It is not directly in the city centre, so preferably take a taxi, which should be about 4euro. They offer asian cuisine with many modern and uncommon recipes and also a variety of house made products. The place gives you feeling of tranquility and purity, food looks and tastes fantastic and staff is very polite and helpful. Pizza Mizza, Tobrucka 5, 81102, Bratislava city center. Try the biggest pizza in town (you can order a pizza up to 50cm in diameter. Carnevalle, Hviezdoslavovo nam. 20, 81102, Bratislava. For all gourmets and high-quality cuisine lovers. Menu is built maily abour various types of meat. Zylinder cafe & restaurant, Hviezdoslavovo square 19 is restaurant which offers typical regional specialities inspired by the times when Bratislava was a part od Austro-Hungarian Empire. You can try typical foods from this region but with standards of modern culinary art. Regalburger, Palackeho 4, 81102, Bratislava city center. 11.am - 10pm. Probably one of the best burger restaurants in town, all burgers are freshly made with a lot of passion. Originally the owner wanted to give his friends a proper alternative to all the well-known fastfood restaurants, but nowadays it is popular by all burger lovers in Bratislava, they only serve burgers, classic burger starts from 6€, english speaking staff. They opened a second shop in foodcourt in Eurovea shopping mall not on the promenade but inside in food court. Prasna basta, Zamocnicka 11. The best old Pressburger restaurant in town. Just few steps from Michalska street,turn left directly after Michalska tower. Really authentic frequented by locals. With hidden inner garden. Luckily it is no longer that hard to find Slovak restaurant among all the Italian, Chinese, Mexican, Indian and other eateries as it was few years ago. Bryndzove halusky,small, spaetzle-like dumplings with sheep's cheese called bryndza and topped with pieces of meat is the national dish of Slovakia and recommended to try. Potent garlic soup but perhaps not on a date and Slovak white wine due to its cooler climate, Slovakia's reds pale in comparison with some of Europe's other offerings, schnitzels, goulashes and other typically Central European foods. Slovak Pub, Obchodna 62. A slightly plebeian but very vivid restaurant offering many traditional dishes. The place is furbished with loads of authentic interiers taken from all over the country. Frequented by local students. Since its first appearance in an official tourist guide the quality deteriorates slowly. Or try one of the local breweries which usually offer some traditional dishes. Mestiansky Pivovar, Drevena 8. Microbrewery featuring a nice bitter lager. Out of traditional Slovak dishes try bryndzove halusky, bryndzové pirohy, sulance s makom, or a duck served with loksa a potato-dough pancake. Starosloviensky Pivovar, Vysoka 15. Another microbrewery featuring, among other beers, also their own lighter lager. They serve also many traditional slovak dishes. The place offers Demikát - a rarely seen traditional soup made of Bryndza. Mamut Pub, Cintorinska 32, 811 08 Bratislava,from city center take any bus/tram to either Marianska, Mlynske nivy or Kollárovo nam and the Pub is just a short walk away. Additionally you can also take the trolley bus number 206 or 208 to Spitalska, which is the nearest bus station. Not necessarily a traditional slovak restaurant rather a pub. Nevertheless it offers traditional slovak food in the daily menu, which is mostly cheaper than in restaurants located in the old town. Moreover you can get slovak beer and draft kofola. Frequently visited by locals, mostly because of the good price. Of course, junk food can be found in Bratislava, too. Try Bratislava's special form of junk food - a richman which is a big bread roll filled with cabbage and cheese and/or meat with mayonnaise. Richman stands can be found on Kamenne namestie, in front of the Tesco building, and in Safarikovo square. You can also try a sub sandwich from one of the many cafeterias in the city, a good one is found in Safarikovo namestie. Another excellent cafeteria is on Zelena Ulica between Ventúrska Ulica and Hlavne namestie. A big sandwich, a bageta from the French baguette with cheese, ham and eggs would cost you about €1.50. McDonalds and Subways are also present. Another specialty in Bratislava but also available in other regions of Slovakia is treska. It is a cold salad made of Codfish with mayonnaise. There are vegetables like onions and carrots in the salad too. It has a very distinct taste, somewhere between sour and bitter - you should try it! You can buy it fresh in most Lahodky shops, which means something like delicacies, but generally stands for old-fashioned fast food shops - they sell salads, soups, etc instead of hamburgers or French fries. Treska tastes very good with rolls. If you like the taste of Treska, you can also buy it packed to take home. If you're low on cash and want to self-cater, there's a huge Tesco supermarket on Kamenne namestie at the junction of sturova and Spitalska directly in the city. You could easily have lunch consisting of a couple of bread rolls, ham, cheese, fruit and maybe a cake or two, for three or four Euros. New American-type shopping malls with big cinemas and of course food courts within reach of the center are Eurovea - right on the river bank, with nice surroundings,just 3minutes walk from centre- from Safarikove names tie and Aupark on the opposite bank of the Danube next to Sad Janka Kraľa park, some 10 minutes from St. Martins's Cathedral and Polus City Center on Vajnorska Street to the north of the city, some 10-15 minutes from the city by tram. Another option to have a cheap meal (4 to 5 Euros) is to go into one of many restaurants in Bratislava that serve daily menus (Mon-Fri usually 11:30 to 14:00). For a fixed price you will get a soup and a main meal usually you get to choose the meal out of 3 to 5 options, drinks are rarely included. It is hard to recommend a good one - just go where you see most locals having their lunches and you'll have a chance to get a good lunch too. If you feel like something healthy there are several places serving fresh made salads in the centre as well as near office building - quite busy during lunch. However be prepared that the salad will cost you more than a full meal. You can get a nice view and can meet some local celebrities at the übercool and very expensive UFO restaurant and disco on top of Novy most bridge. In December, don't miss the Christmas market in front of the Old Town Hall. The traditional foods of the Christmas market are roasted pork or chicken sandwich burgers or ciganska pecienka with mustard and onions, potato pancakes or loksa with various fillings ranging traditionally from plain ones with goose fat, with garlic or goose liver to poppy seed, nut or chocolate. Bread with pork fat and onions is also popular. Also there are a few stands which offer specialities from other european countries. You can wash down the food with a cup of red or white mulled wine or a small cup of honey wine, also tea with or without rum is available, as well as grog or other hot mixed drinks like the Cerveny medved or red bear. Try Kofola, a Slovak & Czech soft drink with a similar colour to Coca Cola, but lower in sugar and caffeine (and carbonation). Some places serve draft Kofola which indeed is draft from a barrel in a way similar to beer until recently it was actually co-produced by a Bratislava brewery. Some Slovaks say draft Kofola is even better than the bottled version and that it is best enjoyed outside in the sun, for example after a hike or a bike or rollerblade ride. Kofola is a popular alternative to beer if you want to hang out but don't want to drink alcohol. Vinea is another genuine Slovak soft drink made from grapes, offered in white (green grapes), red and rose varieties or red grapes. A rather sweet and maybe not-so-tasty soft version without carbon dioxide is also available. There are quite a few Slovak beer brands, e.g. Zlaty Bazant, Saris, Smadny Mních and Topvar. Stein beer is a local Bratislava variety which until very recently was brewed practically in the city centre. There are five micro-breweries offering beer in Bratislava: Meštiansky Pivovar, Richtár Jakub, Patrónsky Pivovar, Starosloviensky Pivovar, and Zámocký Pivovar. If spirits are more your thing, perhaps you will enjoy Slivovica, a fruit-plums brandy of high quality that is associated with Slovakia. The best pubs offering Slovak beers can be found in the Old Town: Kristian in Michalska street, Bar Parada in Hviezdoslavovo square, or AeroPressoDepresso in Venturska street. All of them are quite cheap about €1 per half-liter glass of beer. Beer Palace, Gorkeho 5. Great beer, very tasty food and fun. Bakchus Vinaren, Hlboka 5. A must place for every Bratislava visitor. The best local and indian dishes in town, purely Slovak wines and historical setting of a traditional wine cellar. BeAbout, Presernova 4,Vajanskeho nabrezie 10, near Safarikovo namestie. Su-Th 10AM-midnight, F Sa 10AM-5AM. Music club near the riverside popular with younger crowd. Good selection of beers including Belgian specialty beers. GMT Bar. Very nice cocktail menu with waitress service if you can find a table. Ensure you wear a shirt at the weekends! UFO. If you want to go for extraordinary, visit UFO. It looks like real U.F.O. and it is mounted high above the Most SNP bridge, and you have to use a lift to go there. There is a good restaurant and lounge bar and observation deck. The view is incomparable. Le Senk, Zamocke schody 2. Pub offering 8 different craft beers - offer is changed regularly every few days. Most other alcoholic drinks are available, as well as food (but keep in mind that kitchen is closed on Sunday). Le Senk gets overcrowded on some days and they don't serve people without table - so it's advisable to make a reservation. Larger clubs in Bratislava include Loft, KC Dunaj, Duplex and SubClub, the latter a former nuclear bunker located under Bratislava Castle. There are many smaller bars with dancefloors closer to the centre, such as Radost on Obchodna Street, next to the Slovak Pub. Apollon Gay Club on Panenska 18,the entrance is in the dooryard of a townhouse. Queer Slovakia, dynamic address. the group organises various events for LGBTI people in Slovakia. The program of each event varies – from commercial music to DJ mix sets selection, electro, cafés & beer meetings. Accommodation prices usually do not include city tax. Students up to age 26 and youths up to 18 do not need to pay city tax. Patio Hostel, Spitalska 35. Very popular, located in the center, close to the train & bus stations, easily reachable from the airport. Dorms and privates, free Internet, parking lot, laundry. From €11 plus tax in low season. Downtown Backpackers Hostel, Panenska 31. Dorms from €12 per night per person, double rooms from €21.90 per night per person (plus tax). 18 minutes walk from the central station. Hostel Blues, Spitalska 2, central location and dorm beds from €12.90 (plus tax). Hotel Junior, Drieňova 14. Double rooms from €64 per room per night. Hotel Turist Bratislava, Ondavska 5. Double rooms at €40, triple rooms at €45, near Ice rink (Zimny Stadion), 10 minutes by bus to city center. Hostel Juraj, Karpatska 28. A small cozy hostel located really close to train station and less than a 15 minute walk from the city center. Juraj, the owner, is a friendly man who speaks amazing English and will pick you up from the train station, offer to do your laundry, and provide a great atmosphere. Bed €16,5 in private room (included tax), dorm bed €12,5; €10 for students. Hostel Possonium, Sancova 20. Stylish hostel in the centre. Only 3 minutes by walk from main railway station. Free breakfast, wifi, internet, free laundry, cozy bar, great chill out in garden. Dorm bed from €17, double from €48. Hostel Red Star, Botanicka 25, +421 905 120 514, Seasonal. Dorm bed from €14. Hostel Remy, Stara Vajnorska cesta 37/a,A small, however fully air-conditioned hotel with friendly staff, surrounded by nice garden with little lagoon where you can sit and rest. Hotel Arcus,nice family hotel, big rooms and bathrooms, fresh cooked breakfast, 10 min walk from the old town. Moskovska 5, Rooms from €54/night/include breakfast. Hotel Ibis, Zamocka 38. Double rooms from €48, recently built hotel in central location, just a short walk from the Old town. Hotel Mercure, Zabotova 2. Double rooms from €55, recently built mid-scale business hotel near the main railway station. Venturska Residence, Venturska 3 The newly refurbished holiday apartments located in the very heart of the Old Town. From €68/night. Apartments Bratislava Fully equipped modern apartments for short term stay. Efficient alternative of hotel accommodation in Bratislava Old Town. Price from €49/night/apartment. Abba Hotel, Stefanikova 4. Clean and modern hotel - walking distance to central train station & historic district: just behind presidential palace. Hotel Ponteo, Starorimska 1a, 851 10 Bratislava - Rusovce. We would like to bring you an ideal combination of pleasurable stay and complex offer of services which will meet all desires and expectations. My Bratislava Apartments, fully-equipped comfortable family-run apartments in the city center and suburbs, recommended for families with kids and big groups. Prices from €40/night/2persons. Kempinski Hotel River Park, Dvorakovo nabrezie 6, a highest category hotel, faithful to reputation of the Kempinski chain. It is located in wider city center in newly built pleasant area on the Danube river bank- Riverpark. Albrecht, Mudronova 82. Five star design hotel with 12 rooms and suites nestled on hill above Bratislava castle and Old Town. The Albrecht features flagship restaurant and lounge bar as well as lavish urban spa - unique of it's kind in Bratislava. Devin, Riecna 4. 4 star traditional hotel with 100 rooms and suites. Located in the historical centre of Bratislava, walking distance to all main attraction. It provides accommodation, restaurant, conference services and relaxation center with pool. Gate One, business and conference hotel near airport. Park Inn Danube, Rybne nam 1. Central location overlooking the Danube and the Bridge with swimming pool, gym sauna and whirlpool. Free for guests. Radisson Blu Carlton Hotel, Hviezdoslavovo nam 3. Located in the heart of Bratislava, has been fully renovated and retains many of its original features. Sheraton Bratislava Hotel, Pribinova 12. Located in Bratislava's sophisticated new city center EUROVEA, the first Sheraton hotel in Slovakia offers five star service, 186 stylish guest rooms and 23 suites and Shine Spa - wellness center with indoor swimming pool, saunas, 24/7 gym and many different massages. Falkensteiner Bratislava Hotel, Pilarikova 5, located close to city centre, new four star business hotel. Michalska Brana, in the very city center - no car access. Hotel Hradna Brana, Slovanske nabrezie 15. First class, newly opened hotel has a panoramic view over the Devín castle. It provides accommodation, restaurant, congressional and relaxation services. Residence Sulekova Bratislava, Sulekova 20. checkin: 14.00; checkout: 12.00. Top-quality hotel in the city core of Bratislava. Exclusive design suites by London and Prague duo Jestico+Whiles. Equipped kitchenettes, fitness and sauna centre, business centre, babysitting services and much more. 48 – 192 € per double room. When making international calls, you need to dial 00, then the country code of the country you are calling. The international code of Bratislava is +421 2, the national one is 02. You don't need to use any of these when making local calls. There mostly are cardphones in phone booths, coin phones are located e.g. in front of the telecoms office (T-Centrum) on Namestie SNP Dunaj department store or at Kolarska ulica. You can purchase phone cards at most newspaper kiosks and in any of the T-Centers. Phone numbers beginning with 090, 091 or 094 are mostly mobile numbers. All of Bratislava is covered with a GSM network, the operators being Orange, T-Mobile and O2. In parts of Bratislava mostly up on the hills, mobile phones sometimes switch to Hungarian or Austrian providers, so it is better to check the network name before dialing. If you have a laptop or smart phone, you can use multiple wireless hotspots throughout the city. There is a free-to-use wireless internet available in the city center such as Hlavne namestie, Frantiskanske namestie, Primacialne namestie. Most of the cafes, restaurants and hotels also provide Wi-Fi access free of charge, just ask at the bar or at the reception. Some of the newest public transport buses the red ones with five doors have an free on-board Wi-Fi. Alternatively, you can buy a cheap 3G SIM card from Orange, T-Com or O2 with prices ranging from 6 EUR (O2, 2G / unlimited) up to 20 EUR (Orange, 3G / 5 GB of data). There's a new network called "4ka" ("The Four") which is the cheapest of all carriers (you can get up to 15GB for only 10 EUR), but its coverage is also quite limited, although sufficient if you only stay in downtown Bratislava. You can buy "4ka" sim cards at any post office. Sim cards in Slovakia are not limited to residents, however you will be asked to provide proof of ID upon purchase. For longer stays, it is recommended to rent an internet service from one of the providers such as Orange (fiber, up to 100 Mbit/s / up to 25 EUR per month), UPC (metallic or fiber, up to 100 Mbit/s / up to 30 EUR per month) or T-Com (DSL or fiber). Bratislava is generally very safe by Western standards: it is quite small and the crime rate is low. There is a significant police presence in the city, especially the historical parts, and it is generally not a problem to walk through the city at night. Use common sense when walking alone at night. Stay away from larger loud male groups and you should be fine. If some problem occurs, it is recommended to call the police,dial 158 or 112 they will come quickly. There are many of them deployed in city centre in late night. Parks may be abandoned at night and should therefore be avoided. Use caution when entering pedestrian crossing and check if the cars are slowing down. Under Slovak law, drivers are obliged to give way to pedestrians on a crossing, but the practice is often different. Ruins of Devin Castle are located about 12 km from city centre. You can take buses 28 or 29 from Most SNP - ask someone where to get off as the castle is not visible from the bus stop or walk through the forest about 2-2,5 hrs walk - routes start in suburbs Karlova Ves, Dubravka. You will be rewarded by a beautiful view of Austria and two rivers Danube and Moravia joining each other. From here walk north to Sandberg literally hill made of sand and find some sea-fossils from ages ago. From Sandberg its just a short walk to Devinska Nova Ves from where buses 21 or 28 will take you back to the city. The castle Cerveny kamen is located about 30 km north-east of Bratislava; it can be reached by bus from Mlynske Nivy bus terminal. Do like the locals and hike in the Small Carpathians mountain range. Bratislava lies on the southeast slopes of these mountains. Hiking routes are well indicated. Visit the Small Carpathians Wine Region on the southern slopes of the Small Carpathians there are extensive vineyards and typical wine villages and towns like Raca, Pezinok or Modra. If you are more interested in local wines, follow the Little Carpathians Wine Route. Visit Cachtice Castle, associated with the blood-thirsty deeds of countess Bathory. It is a large and picturesque ruin set on a hilltop above the small village of Visnove. Take the train north from Bratislava to Nove Mesto nad Vahom (75 minutes), and then change to a small local train for the short journey west to Visnove (15 minutes). The Mutenice Wine Region near the Slovak border in the Czech Republic is well worth a weekend visit. It has some of the best wine in the Czech Republic and many great small cellars to visit. You'll need to take a train to Breclav and then from there to Hodonin. Take the train to Trencin - one hour and forty minutes, a Slovak town to the north of the capital with a towering hill-top castle and a picturesque old town centre spread out below it. The Carnuntum archaeological park is located 25 km from Bratislava, across the Austrian border. The site offers the chance to see the excavations of an ancient Roman city. It is worth a one-day visit together with a stop in the old walled city of Hainburg, the first major town in Austria after crossing the Slovak border. Lednice-Valtice in the south-eastern corner of the Czech Republic is a UNESCO World Heritage site containing one of Europe's largest Palacial parklands. Train to Breclav (€8,95 return, April 2016) leaves every 2 hours and takes 51 minutes. From Breclav take bus 570 to Lednice (20Kc April 2016) 20 minutes, roughly once every hour. Senec is a small town 30 km to the west of Bratislava, with the lake resort Slnecne jazera or Sunny Lakes. It is a cool place to swim or relax at the beach in the summer months. The public transport company of Bratislava (DPB) runs a cross-border bus line no. 901 between Hainburg an der Donau (Austria) and Bratislava, with a stop in the Austrian town of Wolfsthal. In Bratislava, the terminus is the stop Nový most. Price is 1,50€/one way or 2,90€/return. Another cross-border bus line is no. 801 between Bratislava and Rajka (Hungary). In Bratislava, the terminus is between the New Slovak National Theatre and Eurovea shopping mall. Price is 1,50€/one way or 2,90€/return when bought in Slovakia or 420HUF/one way or 810HUF/return when bought in Hungary.